About six weeks before President Lincoln traveled to Gettysburg, to dedicate a national cemetery at the place where so many men had died during the Civil-War battle, he made a significant decision. It was the 3rd of October, 1863, when Lincoln pondered being thankful in the midst of a national tragedy which he, and others, called "The War of the Rebellion." The President thought it would be good for Americans to have a national holiday on the last Thursday of November. To be grateful, despite the country being torn-apart by warring American states. To remember the bounty Americans enjoyed, despite the horrific loss of lives on battlefields. It was that action which set in motion an observance still held on the last Thursday of November every year. The words Abraham Lincoln used to declare a national holiday, in order to give thanks, were different—much different, really—from words an American President might use to accomplish the same purpose today. They were penned by Secretary of State William Seward, according to Lincoln's secretary John Nicolay. But the point of the President’s goal, to focus Americans on a national day of gratitude, remains the same. Freedom to pursue the kind of lives we choose for ourselves. Hereafter are the words which first-declared that the last Thursday of November would be an American national holiday. Population has steadily increased, notwithstanding the waste that has been made in the camp, the siege and the battle-field; and the country, rejoicing in the consiousness of augmented strength and vigor, is permitted to expect continuance of years with large increase of freedom. No human counsel hath devised nor hath any mortal hand worked out these great things. They are the gracious gifts of the Most High God, who, while dealing with us in anger for our sins, hath nevertheless remembered mercy. It has seemed to me fit and proper that they should be solemnly, reverently and gratefully acknowledged as with one heart and one voice by the whole American People. It will be seen that the President has made another appeal to the country for volunteers, calling for an addi-tional force of three hundred thousand to be enlisted by the 5th of January ; and whatever volunteers are not obtained by that time, the deficiency to be made up by drafting. 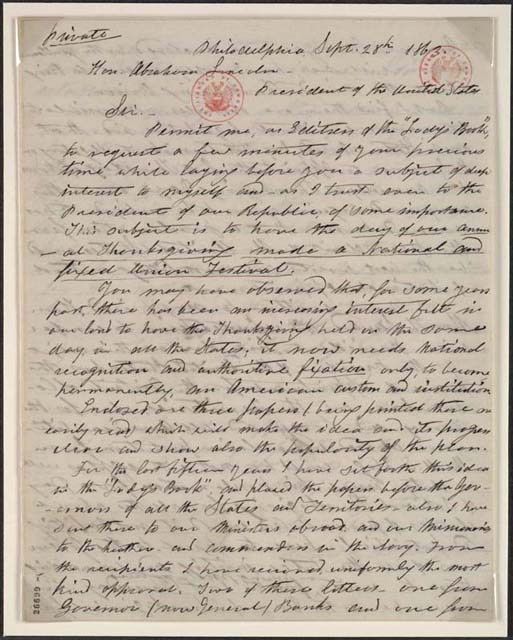 Despite all the turmoil—or maybe because of it—Lincoln issued his Presidential Proclamation for a national day of Thanksgiving. So ... 74 years to the day after George Washington was the first American President to proclaim a day of thanksgiving, Lincoln established the specific day in November which Americans have observed, as such, ever since. Image of President Lincoln online via the Lincoln Presidential Library and Museum. Bos, Carole "Thanksgiving Becomes a National Holiday" AwesomeStories.com. Nov 27, 2014. Apr 26, 2019.